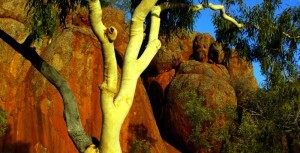 The Animating Jukurrpa website is a showcase of animations and animation styles. The animations are a mix of stop motion animation and After Affects generated animation. Using storytelling modes of sand paintings and paintings on canvas the animations combine traditional storytelling with new technologies in ways that delight the imagination as well as support language and culture. The project was funded in 2009/2010 through the Indigenous Culture Support program of the Dept of Environment, Water, Heritage and the Arts, as well through the Granites Mines Affected Area Aboriginal Corporation. Training support for some of the participants was funded through the WETT Youth and Media program. The animations are now available on DVD through our online shop .